I have been using traditional skin brushes for years and really like them but for anti-aging the FOREO LUNA really is superior to all other facial cleansing brushes. The FOREO LUNA Facial Cleansing + Anti-Aging Device brush ($199) channels T-Sonic pulsations for deep facial cleansing that’s gentle enough to use every day while also incorporating anti-aging technology into its groundbreaking design. The unique combination of T-Sonic pulsations and silicone touch-points gently removes pore-clogging debris. It also helps to reduce wrinkles and fine lines while it firms skin. There are three options with the LUNA. Ulta-Sensitive Skin, Sensitive/Normal Skin, and Combination Skin. I have Combination Skin but after taking the consultation I chose the Ultra-Sensitive. My skin has been irritated by facial cleansing brushes in the past so I wanted go with the most gentle option. They even have one for the Men in your life which I think is awesome. The LUNA™ For Ultra-Sensitive Skin’s brush surface features a wave formation of closely packed, smooth silicone ridges, designed to minimize abrasion for the most sensitive skin. The anti aging surface on the reverse side consists of a series of concentric silicone waves. The LUNA™ reduces the appearance of fine lines and wrinkles and leaves the skin looking and feeling firmer and more elastic. 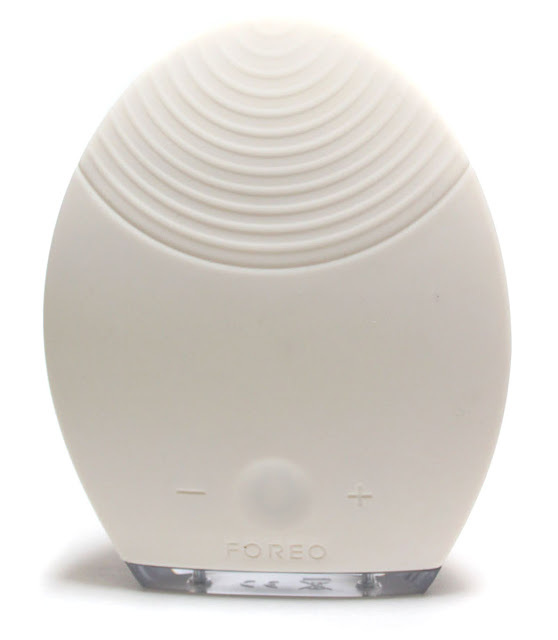 Foreo offers a 2 year limited warranty and 10 year quality guarantee. That shows they really believe in their product. How It Works: Wet the Luna to activate the cleansing mode and gently move the Luna in circular motions over the face for 1 minute. This technology takes some getting used to, I was used to a spinning brush abrasively scrubbing the skin. Luna is a pulsating sensation with a much more gentle feel. For Anti-Aging Activate the LUNA™’s Anti-Aging Mode. Press its anti-aging surface onto wrinkle-prone points for a total of 1 minute. To use: You can use the LUNA with any type of Cleanser. I'm currently using the LovelySkin LUXE Gentle Cream Cleanser ($40). This cleanser is a SPA experience in a bottle. The moment you put it on your face it is so soothing and hydrating that you will forget you ever had dry irritated skin at all. Made with meadowfoam seed extract and olive oil extract, this gentle cleanser leaves the complexion comfortable and glowing. After use, skin feels clean, hydrated and healthy. I would highly recommend it for any one with sensitive skin or battling dry Winter skin. I use the LUNA with my cleanser nightly 3-4x a week and have been pleased by the results. The LUNA removes dead skin cells and unclogs pores of dirt, oil, and makeup residue, while enhancing the absorption of your skincare products. At first I didn't know if it was working until I realized my skin had become clearer with less breakouts and my complexion more even looking over all. As for anti-aging there is a softer appearance to fine lines with a smoother skin texture. I also just love how cute this little egg shaped thing looks! Bonus for not having to buy replacement brushes or recharge it for months. I do think the Normal/Sensitive Skin Brush which is the most popular would be best for most people. I wish I would have chosen that one for a more powerful cleansing action, but I am still happy with the Ultra-Sensitive brush for not breaking me out or being too harsh. Cleansing brushes are still in rotation on days when I wear a lot of makeup, so this will not take the place of brushes like the Clarisonic or Michael Todd Soniclear. I just don't feel like it removes makeup as effectively. What I do like this for is anti-aging, the overall smooth and even appearance it gives my skin is noticeable when I put this to use the night before. For that I am happy to have added the LUNA in to my skincare routine. FOREO Luna has revolutionized skincare beyond the brush and is an excellent addition to any anti-aging skincare routine.